Whether it’s a new year or a new quarter, it’s never too late to start planning. Sure, it takes focus, time, and organization—but if you put the energy into making a plan now, you’ll be reaping the rewards all year long. Organizations are notorious for treating comms as an ‘on demand’ service. 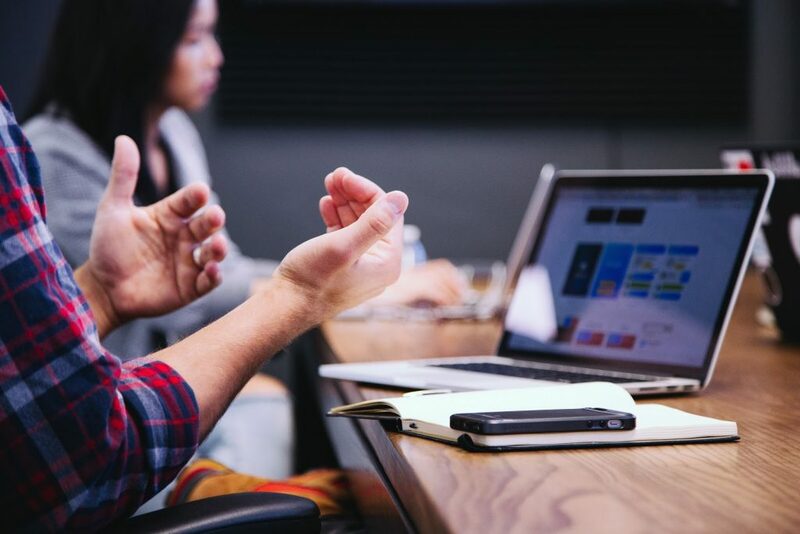 Combine that with lack of resources, long approval trees, and often not having a seat at the table, it is a struggle to do your job well, on your term, and align your efforts with your organization’s business objectives. This is why planning is a communicator’s secret weapon. 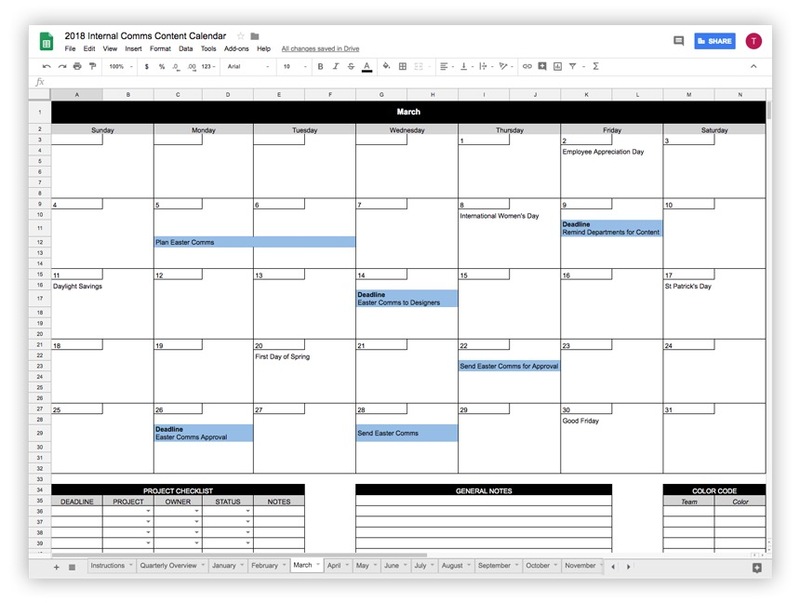 Creating an internal comms content calendar will make it all just a little (or a lot!) easier. Better collaboration among your team, leadership, and various departments. 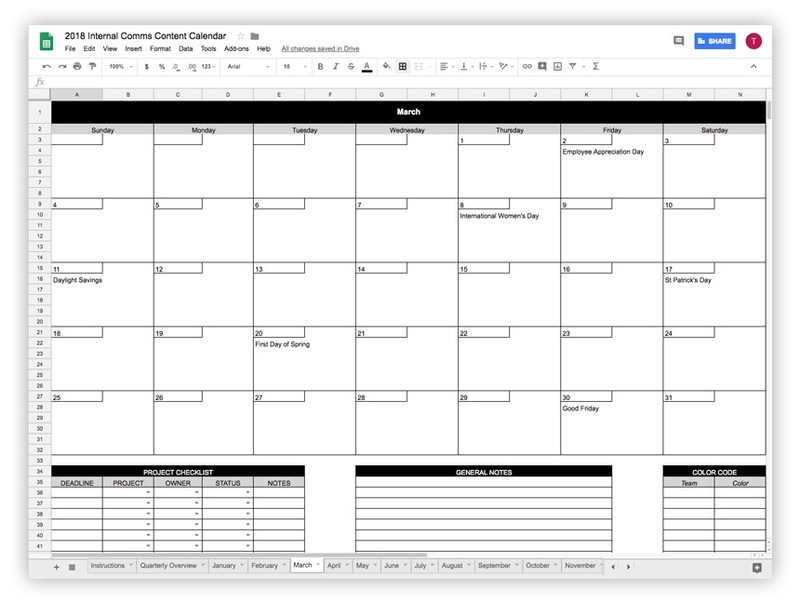 To get started, create an excel sheet, or download our template here. Do you send out holiday communications every year and need content from various departments or stakeholders? Pick a date for that communication now, throw in the deadlines for various contributors, and mark down when you have to have things to the design team in order to get the communication out on time. Make sure you give yourself lots of breathing room—it is better to overestimate how long something will take rather than underestimate. Figure out how long it usually takes you to get approval for these communications, and schedule that in, too. This will help you stay on top of communications you could be pulled in on, well in advance. 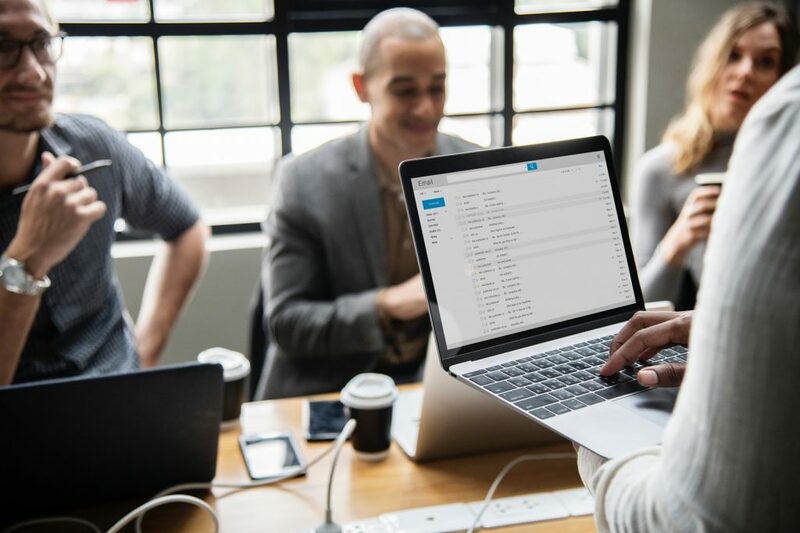 It gives you the ability to remind them beforehand that you need content, dates, or their details, instead of being pulled in at the last minute. It is helpful to add a quarterly reminder to your calendar to check in and remind various contributors to confirm those dates and your lead time. Throw that reminder in your calendar too. Do you have a monthly newsletter? A quarterly CEO address? All-hands or town hall meetings? 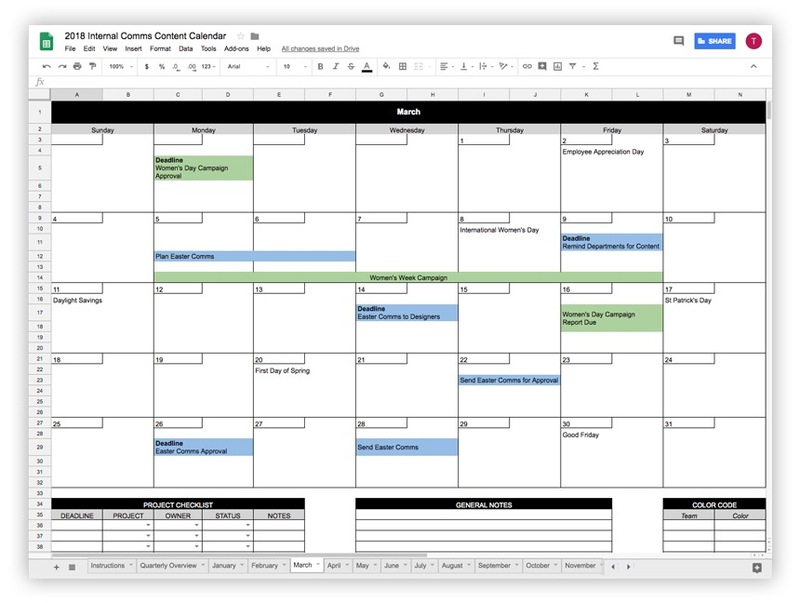 Put in your content deadlines, reminders, and the day that all the communications need to go out into your calendar. This is a good time to look over what you’ve got scheduled and move things around if need be. Step 6 – Share it! 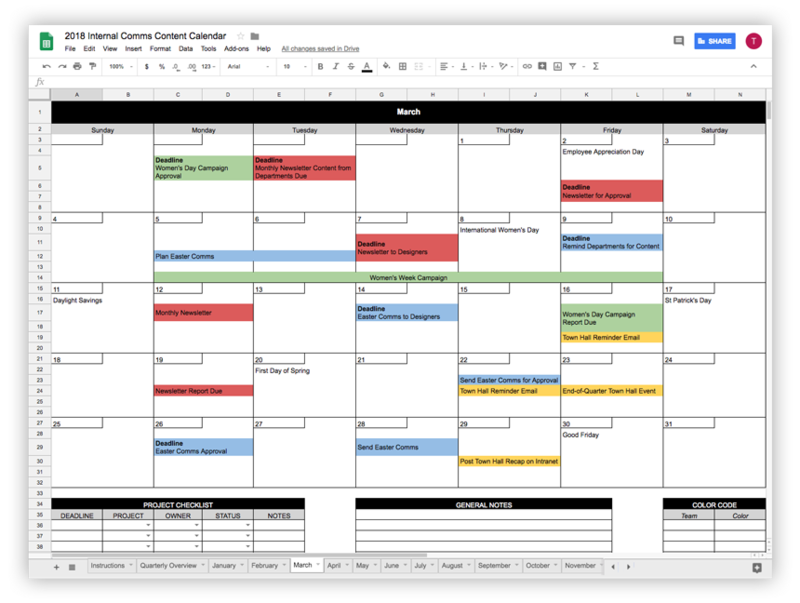 Now that you’ve added a little more organization into your communications process, you can keep streamlining your workflow, figure out how long things take, and adjust accordingly to make your job and life easier, and see better results. Join the conversation below and share your secrets to success when it comes to planning your internal comms.